Here you will see your basic 'Profile' information. This information will also be shown to all other staff members if the management has the 'Settings' -> 'Staff Setting' -> 'Employees can edit their profile' and 'Employees can view staff gallery' enabled. This displays your first then the last name throughout the system. This is an employee identification number (Eid) used in many payroll programs that you can set as required. This is used to sign in as and needs to be unique in our entire system. You set this once you receive your Activation Link. The home phone number for other staff members to see. You will receive Humanity email alerts to this address. This can also be used to sign in with and along with your 'Username' identifies your account. This is your employee base 'Regular' wage in contrast to a 'Special' or 'Overtime' wage. This can also be set to change based on the 'Position' or the time of day worked. This shows your birthday as 0 if none has been entered yet. These are the 'Positions' that you are assigned to work. 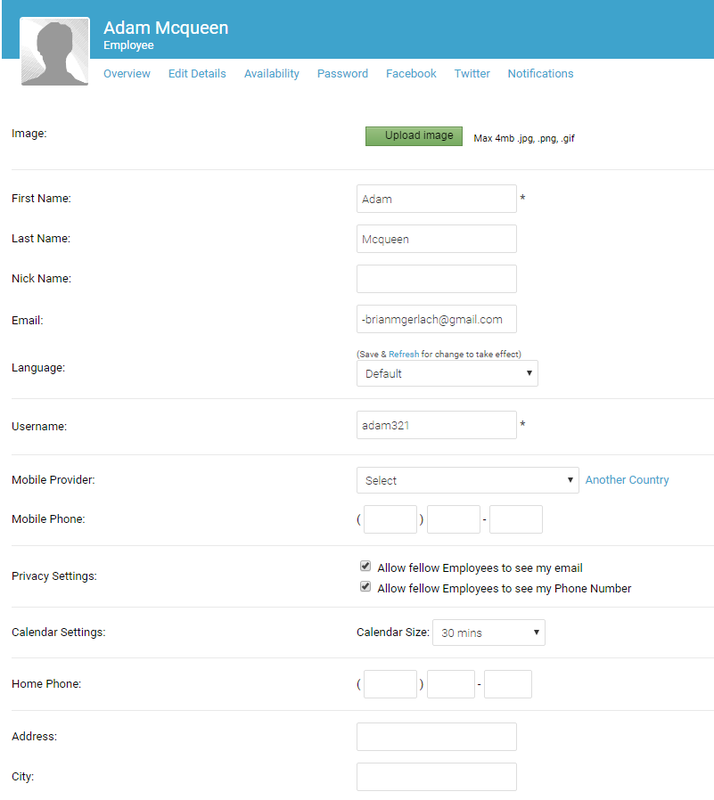 Here is where you can edit your 'Employee Details' along with a few other features. Here is where you can upload your 'Profile Image.' Click 'Choose File' then select your local file to upload. The image must be under 4mb and be a .jpg, .png or a .gif file type. The only way to 'remove' an image is to replace it with another one. This displays your first then the last name throughout the system. The first word will be your first name and the second word will be your last name in the system. You will receive Humanity email alerts to this address. This can also be used to sign in with and along like their 'Username' identifies their account. This is used to sign in as and needs to be unique in our entire system. You set this once you receive your 'Activation Link' or it can be set manually by management. This is used to receive text alerts from the system. If yours is not listed, you can request it here. 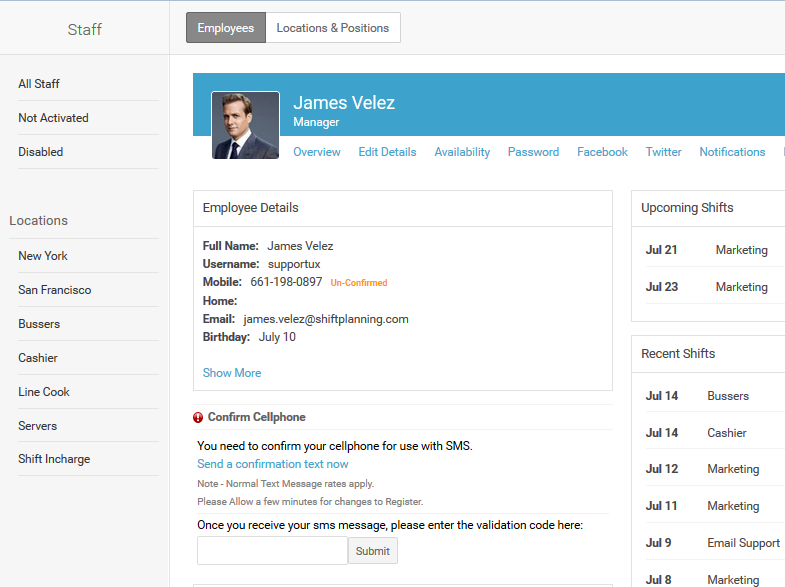 With your privacy in mind here you can set whether or not you want fellow employees to see your email or phone number. 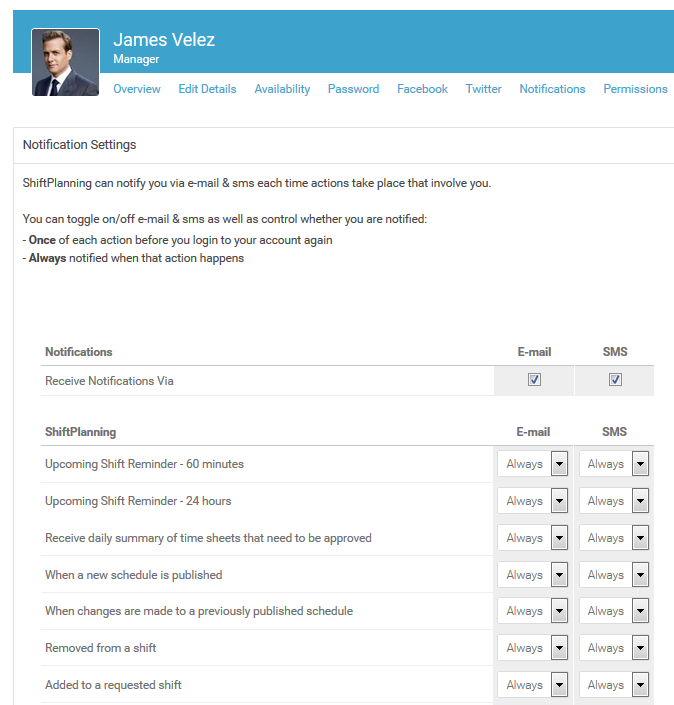 Here you can change your calendar setting from 15 minutes to 30-minute increments. Your home phone number for other members to see or for reference. This is your default pay rate. This is your mailing street address. This is your mailing city. This is your mailing state or province. This in your mailing postal or zip code. Here you can select your time zone if it isdifferent than the main office and your shifts will show in your local time.